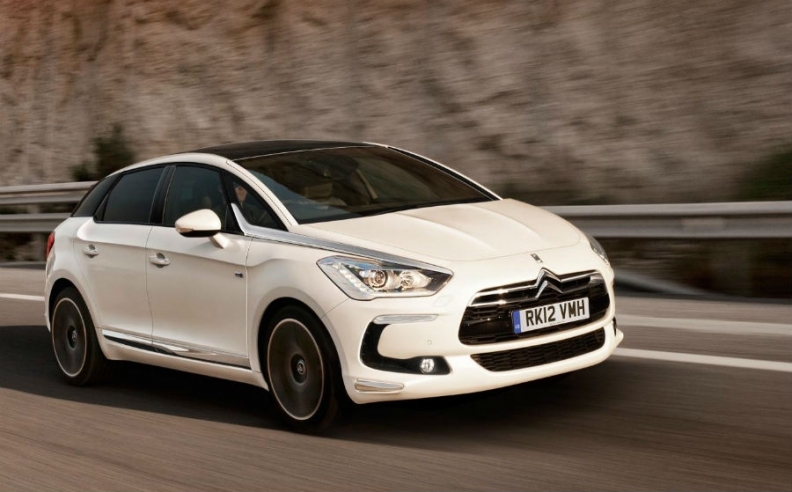 Demand for models such as the DS5 helped Citroen increase sales in April. FRANKFURT -- Strong demand for premium and near-premium cars helped BMW, Mercedes-Benz, Audi and Citroen buck the downward trend in European new-car sales last month. The three German luxury carmakers and the French mass producer were the only brands among Europe's top 10 sellers to achieve year-on-year sales gains in April, according to data from JATO Dynamics. BMW, which benefitted from the success of its new-generation 3 series, increased sales 3 percent to 55,008 units in April. Mercedes boosted volume 5 percent to 50,896 vehicles last month because of strong demand for the new B class while Audi's sales rose 4 percent to 61,171. Citroen increased its April sales 5 percent to 61,782 vehicles thanks in part to the success of its near-premium DS4 and DS5 models. Despite declining sales in April, Volkswagen and Ford remained Europe's No. 1- and No. 2-selling automakers by volume in an overall market that fell 6 percent to 1.06 million, according to JATO. April sales at Europe's largest carmaker, VW, fell 8 percent to 139,124. Ford's volume dipped 10 percent to 79,632, while sales at France's Renault slipped 17 percent to 70,654. Of the 10 best-selling models last month, only two saw an increase in sales compared with April 2011: BMW's 3 series, up 17 percent, and the Fiat Panda which rose 3 percent. Demand for the sixth-generation Golf, which debuted in 2008, fell 13 percent to 37,151 units last month. The compact kept its No. 1 ranking despite the decline, which is typical for a model that is nearing the end of its product cycle. Volkswagen plans to debut the seventh-generation Golf at the Paris auto show in September. Sales of the Ford Fiesta subcompact, Europe's second-best seller, declined 9 percent to 25,927 in April while demand for the No. 3-ranked VW Polo subcompact slipped 23 percent to 24,193. Of the five major European markets, only two had a sales increase last month. Demand in the UK rose 3 percent to 142,322 vehicles, while sales in the region's biggest market, Germany, continued to defy a downturn in consumer confidence in the Eurozone countries by rising 3 percent to 274,066. In France, sales fell 2 percent to 166,552, while in Italy they dropped 18 percent to 130,245. Spain was worst hit with a decline of 22 percent to 56,183. Since the beginning of the year, European sales have fallen by 7 percent to 4.85 million compared with the same period in 2011, JATO said.